Chimney Tops trail is one of the most well-known trails located off Newfound Gap Road due to the panoramic views the trail offers. Though the hike is only two miles up, it is a very steep trail that hikers can’t always complete. With the first half of the trail being fairly simple, the second half is a 960-foot elevation climb to reach the top. The Chimneys are one of the few peaks in the Smokies that have a bare rock summit. 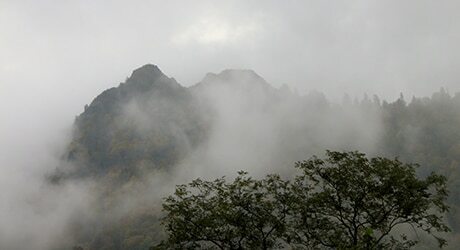 Chimney Tops Trail Upgrades: The trail has had some major upgrades over the past two years’ courtesy of the Trails Forever program. Renovations include: construction of rock steps, renovating existing water drainage systems, creating new ones and redefining different sections of the trail that were no longer suitable for hikers. The new bridge at the start of the trail reopened in July of 2013. Hiking Chimney Tops Trail: On the first stretch of the trail hikers will follow cascading waters of Road Prong Creek which crosses a few foot bridges before arriving at Beech Flats. Once hikers reach the Beech Flats junction, which is the hikes halfway point, veer to the right to continue onto Chimney Tops trail. The left track leads to Road Prong Trail, which leads to the Appalachian Trail at Indian Gap on Clingmans Dome Road after an additional 2.5-mile hike. 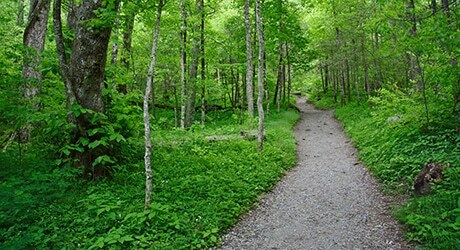 What’s interesting about the Road Prong Trail is that it’s one of the oldest trails in the Smokies dating back to the 18th century, where it served as a through-road known as Indian Gap trail. Again, keep to the right from Beech Flats to stay on the Chimney Tops trail. The second half of the hike is where it starts to get difficult as the trail takes a western curve accompanied by a 730 feet elevation climb for roughly two-thirds of a mile. The trail then takes a northern climb up the ridge to the summit, giving a nice view of the mountains out of the east. There is the option of continuing up the ridge to reach the top of the pinnacles, which is another 50 feet climb. Injuries are possible so be sure proper attire is worn and avoid the climb if the rocks are too wet. The Chimneys are one of the few peaks in the Smokies that have a bare rock summit. When the mountains were inhabited by the Cherokees this summit was referred to as a forked antler as the mountain resembles the antlers of a deer. Take I-40 Exit 407 and follow Highway 66 South for 8 miles to 441 South to Gatlinburg. From 441 South on Newfound Gap Road, after about 6.5 miles, you will pass the Sugarlands Visitors Center. There is a parking on the right of the road with the trailhead sign. Be sure to not confuse the Chimney Tops Picnic area from the trailhead. You will want to make sure to have a camera handy to stop and snap some pictures of the outstanding views along the trail in addition to the stunning view at the top, where you’ll be at an elevation of 4,724 feet. Enjoy your Chimney Tops Trail adventure!